How To Party With An Infant by Kaui Hart Hemmings is a novel about Mele, a single mother living in San Francisco. Her daughter’s father (her ex-boyfriend) left her while pregnant to return to his fiancee (the existence of whom Mele was unaware of). As a new mother, Mele cast around for a group of other parents to hang around with. She started with the San Francisco Mom’s Club (SFMC), and was mismatched with a group of wealthy SAHMs before finding her tribe at a less tony playground, and the book is about those friendships and the imperfection of modern parenting. How To Party With An Infant has an interesting structure. Mele is a foodie and a blogger, and when the book opens, she is submitting an application to the SFMC to supply recipes for the group’s cookbook. Hemmings teases out the backgrounds of each of Mele’s playground friends through the application, as Mele concocts a recipe inspired by each person and his or her individual story. (This construct reminded me a bit of Kitchens Of The Great Midwest, though it was used much better in that book.) I found the cookbook application structure to be forced and ultimately unnecessary. Hemmings could have written the book without it and nothing would have been lost. There’s a meal at the end where Mele serves her friends the dishes they inspired; this meal could have taken place without the cookbook application. Hemmings also switches back and forth between first and third person narration depending on whether Mele was doing the application, which is a little jarring. On the other hand, How To Party With An Infant is entertaining and incisive, skewering a lot of mom types and relating the bittersweet nature of parenting small children. I laughed out loud several times while reading it, and I was always happy to pick the book back up again. There isn’t much of a plot, but there are a lot of funny vignettes throughout involving Mele or her friends. It’s an easy read, a wisp of a novel that doesn’t leave much of a mark but is enjoyable in the process. My favorite scene is a wedding that takes place at the end – Mele’s ex-boyfriend’s – which was just totally relatable and ultimately uplifting. Reviews of this book are a bit all over the place. My best friend loved it, and she’s a very reliable barometer for books. In the end, I was glad to have read it, but honestly can’t remember all that much about it since finishing it 5 days ago. If you want an entertaining, breezy read, give it a try. Posted on December 6, 2017 by gayle. 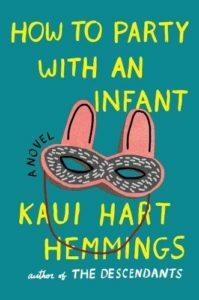 This entry was posted in Fiction and tagged how to party with an infant, kaui hart hemmings. Bookmark the permalink.